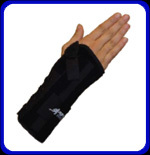 Universal Lace-up Wrist – Pacific Medical, Inc.
Easy to apply wrist brace is designed to provide "customized" fit every time the brace is applied. Contoured palmer stay combined with a unique lacing system allows full function of the fingers while providing excellent wrist stabilization. Available in 7 inch and 10 inch lengths.